It probably goes without saying that you can’t learn how to do well at poker, or even hope to do so, unless you know the various poker hands and the rank of each poker hand. You should commit to memory the order of the best poker hands. This can avoid costly mistakes that arise out of thinking you are winning the hand but in fact one of your opponents has you beat with a better hand. But don’t worry it will start to come naturally the more poker you play. It will be second nature in no time at all and you won’t even have to think to remember them. The best way to learn the list of poker hands is to get some practice in by playing so get started by visiting our where to play poker guide to download online poker software and either get some practice in at the play money tables, or the low stakes real money tables and watch which hands are beating the others, using our guide below as an aid. If you do this you will know the winning poker hands off by heart in no time at all. A standard playing card deck of 52 cards is used for poker. Poker card ranks are descending from the Ace, which is the highest to the King, Queen, Jack, then 10 on down to 2. The Ace, depending on the game, might be the lowest or highest card. The four suits – hearts, spades, clubs and diamonds all carry an equal value. Although there are many different variants of poker which you will learn in our poker games section, the majority of games use one of two lists of hand rankings. High Poker Hand Ranking – this is the most common and is used in the most popular poker games such as Texas Holdem, Omaha and Stud. The highest hand is the best hand. Low Poker Hand Ranking – this is less common but used in games such as Razz. With these games the aim of the game is to get the lowest hand ranking. A poker hand is five cards, made up out of a combination of the cards dealt to each player (called the “hole cards”), and community cards that are dealt to the centre of the table which are used by all players. Interesting fact… there are 2,598,960 card combinations possible in a poker hand. The high poker hand rankings is the most commonly used and is used in the most popular game of poker Texas Holdem which is the game we recommend you start with. There are ten different hands for the high poker hand rankings which are all detailed below. If you memorize these hands and remember their order it will help you determine how good your hand is whilst playing poker. The short version …. Royal flush -> Straight flush -> Four of a kind -> Full house -> Flush -> Straight -> Three of a kind -> Two pairs -> One pair -> Just a high card. Now lets look at each in detail. A Royal Flush is the highest poker hand possible, although extremely rare. To get a royal flush you need an Ace, King, Queen, Jack and Ten all of the same suit. All royal flushes are equal regardless of the suit. A Straight Flush is where there are 5 cards running in numerical order all of the same suit. An ace can count as low so 5-4-3-2-A all of the same suit counts as a straight flush. If there are two straight flushes the hand is awarded to the player holding the highest card. Four of a Kind or otherwise known as “quads” is where there are four cards all of the same value like four Jacks. The fifth card can be any card and does not affect the hand. In the event of there being two players with Quads, the player with the higher value Quads will win. For example, Quad Eights beat Quad Fives and so on. A Full House contains three cards all of the same value and two cards of another value. So if a player has three Aces and Two Kings his hand is known as Aces over Kings. If two or more players has a full house the winner will be the player with the higher value three cards and if both players has the same value three matching cards the winner is then decided on who has the highest value two matching cards. A flush is made when a player has five cards all of the same suit and that are not in numerical order. If more than one player has a flush the winner is decided by the player holding the highest value card. If both players have the same highest card, the second highest is compared and so on. A Straight is made when a player has five cards of any suit running in numerical order. An Ace can be counted as high or low so the highest straight possible is A-K-Q-J-10, known as a Broadway straight and the lowest is 5-4-3-2-A, known as “the Wheel”. If two or more players has a straight, the winner is decided by the player who holds the highest value card. If both highest cards are the same the pot is split between all winning players. Three of a Kind also known as “Trips” or “ a Set” is made when a player has three cards all of the same value and two other cards of a different value. If two or more players has this hand the player with the highest value three matching cards will win. Two pair is made when a player has two cards of the same value and a different set of two cards also of the same value. If more than one player has two pair the winner is decided by the player who has the highest pair. If both players has the same high pair the winner is then decided on who has the highest second pair. 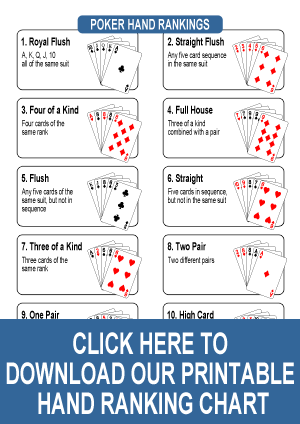 If both players has the same two pair the fifth card is compared and the player holding the highest card wins. A pair is where only two of the five cards in the hand are of the same value. If more then one player has a pair the player with the highest value pair wins the pot. If both players has the same pair the next highest value card in the hand is compared to determine the winner. The lowest poker hand you can get is a high card hand. This is where none of the above hands are made and so you declare the highest card in your hand. If your opponents also have not made a hand then the player with the highest card in their hand is the winner. If the highest card in this hand is an Ace, it is known as Ace high (the example shown), or if it’s a King the hand is known as King high and so on. There are many poker games where the player holding the best poker hand is decided by the player which has the lowest possible hand and not the highest hand. An example would be Razz. There are also games such as Omaha Hi Lo and Stud Hi Lo where the pot is split into two with one going to the high hand and one to the low hand. Low poker hands are counted back from the highest value card first, so keep this in mind when reviewing your hand. This is a common mistake made by novice players which can lead to loosing chips unnecessarily. Each hand will consist of five cards and the winner is determined by who has the lowest high value card. 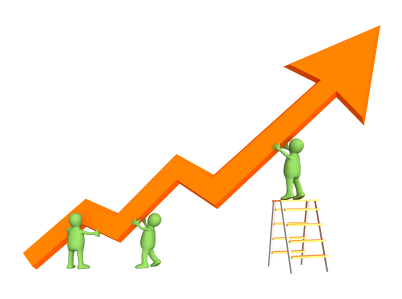 If the highest value card held by each player is equal then it comes down to the lowest 2nd high value card, if they are equal it carries on to the 3rd high card and continues right down to the fifth card if needed. The winner is determined by who has the lowest high value card. Ace is treated as a low card and is the equivalent to a 1, the lowest card you can get. The suits of the cards makes no difference to the outcome or rank of the hand and they are ignored. There are no straights or flushes in low card hands. On the right are two example hands. To determine the winner in a low hand game you would start with the highest card. Both hands highest card is an 8 so you would move to the next highest card. As the highest three cards in both our example hands are the same the fourth card is compared. Player one has a lower fourth card holding the three compared to player two’s four so player one would win the hand. The fifth card in this example is irrelevant as the hand winner has already been determined by the fourth highest card. Well, that’s a lot of information to take in so the only way that you will learn the poker hand rankings is to get some practise and experience. We recommend that you get started by visiting our where to play poker guide to download online poker software and either get some practice in at the play money tables, or the low stakes real money tables and watch which hands are beating the others, using our guide below as an aid.